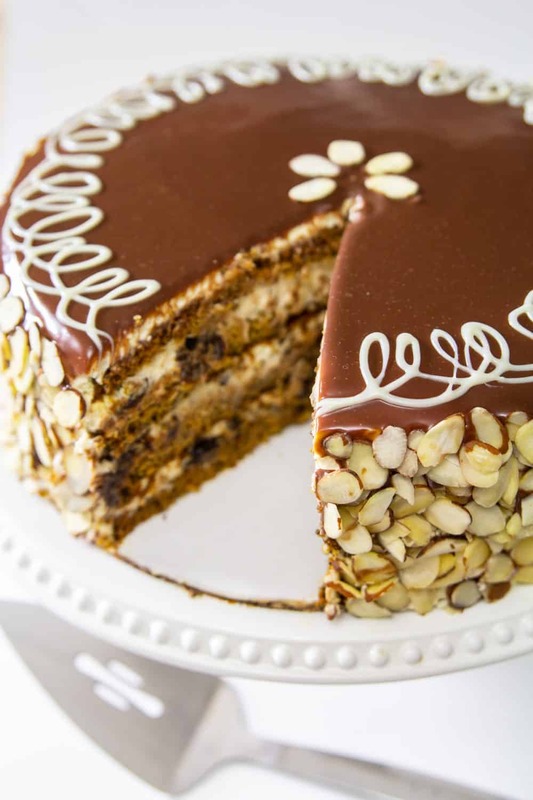 If you haven’t already planned a New Years Eve dessert menu, make sure to put this royal honey cake on it. The cake batter is made of cooked honey and poppy seeds. The cream is made of cooked sweetened condensed milk, sour cream, sugar, and heavy whipping cream. And in between all of that rich goodness there’s a generous amount of dried plums. If you set out to make this cake for an event, make it about 2 days in advance. The cake tastes so much better after it sits for a day or two. This way, the flavors have time to blend together, and the poppy seeds aren’t as dry. 1. Cut the prunes into small pieces using kitchen shears and set aside. 2. Line 2 round 10 inch baking pans with parchment paper and spray them with nonstick spray. 3. In a saucepan heat the honey and baking soda over medium low heat and keep stirring until it becomes a dark caramel color (about 7 mins). Don’t step away from the saucepan, it can burn very quickly. 4. Add 2 stick of butter and stir over low heat until the butter fully melts. Then remove from heat and let it cool. 5. In a separate bowl, mix the eggs and sugar with an electric mixer. Mix until the eggs become slightly foamy. 6. In another bowl, combine the flour and poppy seeds together. 7. Pour the beaten egg mixture into the honey and baking soda mixture. 8. Then add the flour and poppy seeds to the batter. 9. Evenly split the batter between the 2 baking pans. Bake at 340 degrees Fahrenheit for 15 minutes or until a tooth pick comes out clean when pierced through the middle. Once the cake is baked transfer to a cooling rack and let it cool completely. 10. Meanwhile, beat 1 stick of butter with the cooked sweetened condensed milk. Add the sour cream and mix just to combine. 11. In the bowl of a stand mixer beat the heavy cream and 2 tbsp sugar using the whisk attachment. Beat until the heavy cream becomes light and fluffy. 12. Fold the whipped heavy cream into the sweetened condensed milk. 13. Slice each cake in half using a serrated knife. This will be the 4 layers of the cake. 14. Generously spread the cream onto the first cake layer. Then add the prunes. 15. 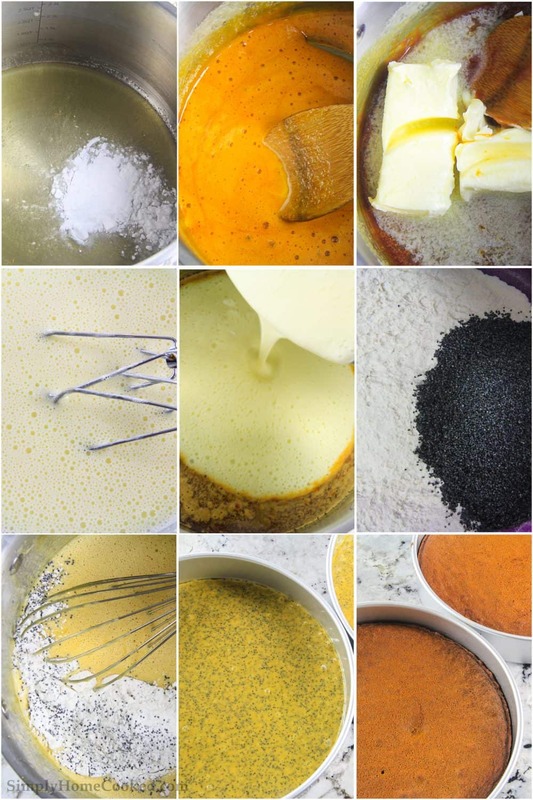 Spread a thin layer of the cream onto the inner part of the next cake layer before placing it on top of the cake. This way the prunes are sandwiched between cream from top and bottom. 16. 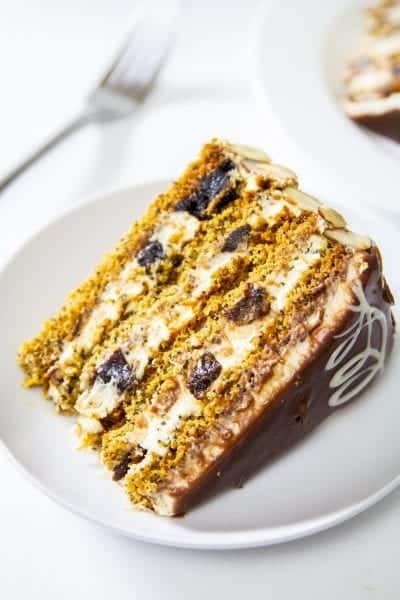 Continue layering the cake with cream and prunes until the 4th cake layer is placed on top. From here, just frost the cake with rest of cream. 17. I decorated the top of cake with chocolate ganache and sliced almonds on the sides. Cut the prunes into small pieces using kitchen shears and set aside. Line 2 round 10 inch baking pans with parchment paper and spray them with nonstick spray. In a saucepan heat the honey and baking soda over medium low heat and keep stirring until it becomes a dark caramel color (about 7 mins). Don't step away from the saucepan, it can burn very quickly. Add 2 stick of butter and stir over low heat until the butter fully melts. Then remove from heat and let it cool. In a separate bowl, mix the eggs and sugar with an electric mixer. Mix until the eggs become slightly foamy. In another bowl, combine the flour and poppy seeds together. Pour the beaten egg mixture into the honey and baking soda mixture. Then add the flour and poppy seeds to the batter. Evenly split the batter between the 2 baking pans. Bake at 340 degrees Fahrenheit for 15 minutes or until a toothpick comes out clean when pierced though the middle. Once the cake is baked transfer to a cooling rack and let it cool completely. Meanwhile, beat 1 stick of butter with the cooked sweetened condensed milk. Add the sour cream and mix just to combine. 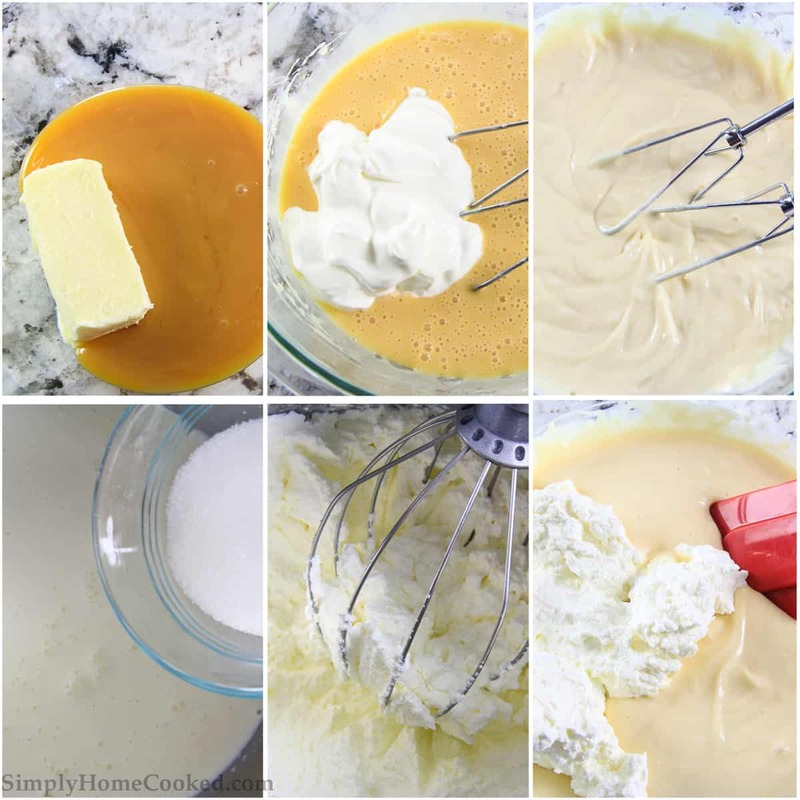 In the bowl of a stand mixer beat the heavy cream and 2 tbsp sugar using the whisk attachment. Beat until the heavy cream becomes light and fluffy. Fold the whipped heavy cream into the sweetened condensed milk. Slice each cake in half using a serrated knife. This will be the 4 layers of the cake. Generously spread the cream onto the first cake layer. Then add the prunes. Spread a thin layer of the cream onto the inner part of the next cake layer before placing it on top of the cake. This way the prunes are sandwiched between cream from top and bottom. 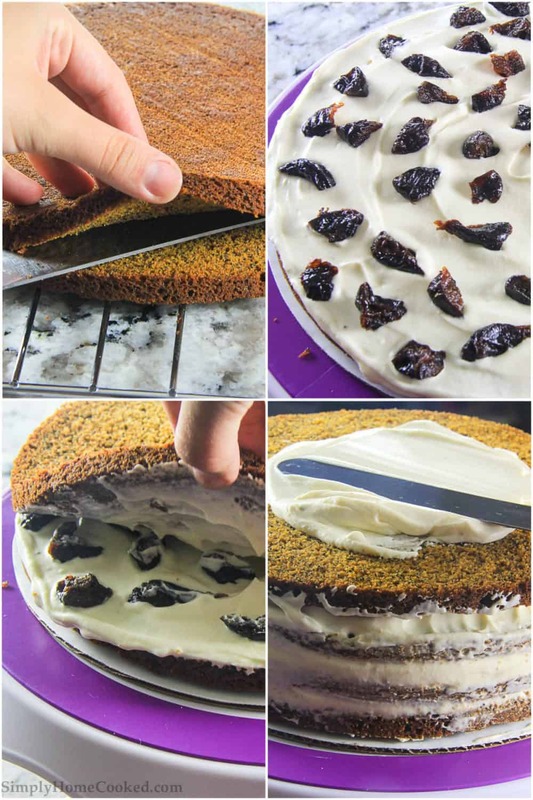 Continue layering the cake with cream and prunes until the 4th cake layer is placed on top. From here, just frost the cake with with rest of cream. 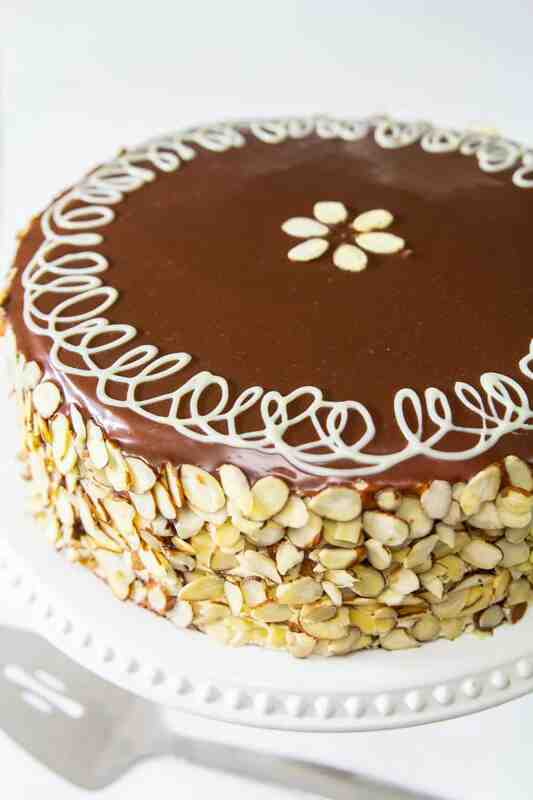 I decorated the top of cake with chocolate ganache and sliced almonds on the sides. Hello, does the honey mixture have to cool completely before adding the egg mixture into it? Or is warm fine? Hi Tanya, it’s ok if the honey mixture is still a little warm when added to the eggs. I’ve made this cake maybe 5 times now and everytime the flavors are all there and it is such a crowd pleaser, but the centers of it always fall when I bake it. I cook it for almost 30 minutes instead of the 15 because the first couple of times it was still raw. I do however use a 9inch pan instead of a 10inch… but I want to figure out why it always falls in the center. I always make sure I beat my eggs and sugar long enough amd do everything according to the instructions and measurements. I just want it to not fall for once… or ever again. Help. Hey Svetlana, I’m so sorry to hear that keeps happening to your cake. That sounds really frustrating! There are very few reasons why cakes sometimes sink. The most common reason is over-beating the batter. Another (not so common) reason could be having too many wet ingredients. By that I mean… if you live in a humid area, you’re flour could be absorbing moisture from the air, which may be causing the batter to have too much moisture. Again, this is very rare though. I really hope that answers your question. I would love to know if any of those tips helped. Beautiful cake, putting it on my to-make list! One way to make the poppy seeds less dry is to soak them in boiling water before using them in the recipe. I measure out the seeds and put them in a small bowl and cover them with boiling water. I let the seeds soak until I am ready to use them in the recipe. I drain off the excess water and they are ready to use. I do this any time a recipe calls for poppy seeds. Also works great for raisins that have dried out a bit! Thank you Anastasia, what a great tip! I have one more question – was the oven temperature supposed to be 350 degrees? The directions said 340, which I did, but it took longer to bake the cake layers than 15 minutes. Do you need to refrigerate this cake once it is all assembled? Hi Rachel, yes keep the cake refrigerated after it’s assembled. Hi Lana, the only thing I could think of is maybe you didn’t put enough flour? hi i wanted to know do i need to put the cake in the fridge for little because my cream is very runny and the cake does not stand straight? Hi Lana, if the cream is runny put it in the fridge for a few hours. Is the cake not be straight because of the way it was cut? By cooked condense milk, do you mean what we South Americans call dulce de leche? Cooked condense milk is not availabe in my area, and if you cook it yourself, how do you go about it? Thank you. It look incredible! Would like to make it for New Year. Hi Kelly, yes it’s the same thing as dulce de leche. You can make it yourself by filling glass jars with the sweetened condensed milk. Close them tightly, place them in a slow cooker and submerge them fully with hot water. Cook on high for 4 hours. Wait for them to cool before opening. Hi, I would like to thank you for your hard work. Is is possible to give the measurements in grams as well? Thanks a lot. My mom made this yesterday for our family’s New Years party and it was REALLY good! I especially want to note that it was fluffy and moist, because I personally don’t like dense cakes. Thanks! You’re so talented Dina! You do such a beautiful job decorating cakes!! Natasha you’re so sweet, thank you!